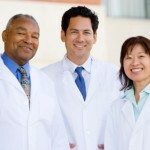 In this section you can provide a master list of information about all the doctors associated with this practice. In other sections of this control panel you will be able to associate any doctor listed here with a particular practice location or particular website. For each doctor, you can enter a wealth of information including a photo, video, credentials, association memberships, and a short statement of philosophy. The “Doctors” section of the Control Panel is where you enter a master list of all the doctors associated with your practice. In the “Locations” section of the Control Panel, you can select which doctors work at which practice locations. In the “Customize Portals” section, you can determine which doctors will be shown on any particular website. To add a new doctor, go to the “Doctors” section and click “New Doctor.” Enter the doctor’s name as you would like it to be displayed. Select the accreditation and gender. Choose a prefix like “doctor,” enter the person’s full name, and check the box to indicate if they are a partner at the practice. It’s also good to upload a picture of the doctor that is 120 pixels wide by 150 pixels tall. You can also include a personal video of each doctor within that doctor’s profile. This video will be shown on that dentist’s “Meet the Doctor” page on your website. This is in the “Doctor Info” tab. If we move over to the “Logos” tab, we can select logos of organizations of which this doctor is a member. There are suggestions on the right, and a drop-box that lets you sort by category. You can also click “New Item” and upload your own logo image file. The “Credentials & Memberships” tab is similar, but lists the names of the organizations rather than their logos. When you click “New Item,” “New Association” will appear on your list. Click the pencil icon to edit the text. Use the arrow buttons to re-order your list, and the trash can icon to delete an item. Under the “Philosophy” tab, you can optionally include a philosophy statement from that doctor. We’ve provided suggestions at right that you can use, or you can edit the text, or enter your own. You can always edit a doctor’s information just by clicking the pencil icon. Remember, the “Doctors” section of the Control Panel is your master list of all doctors. Choose from this master list when associating doctors with locations and dental websites in other sections of the Control Panel.